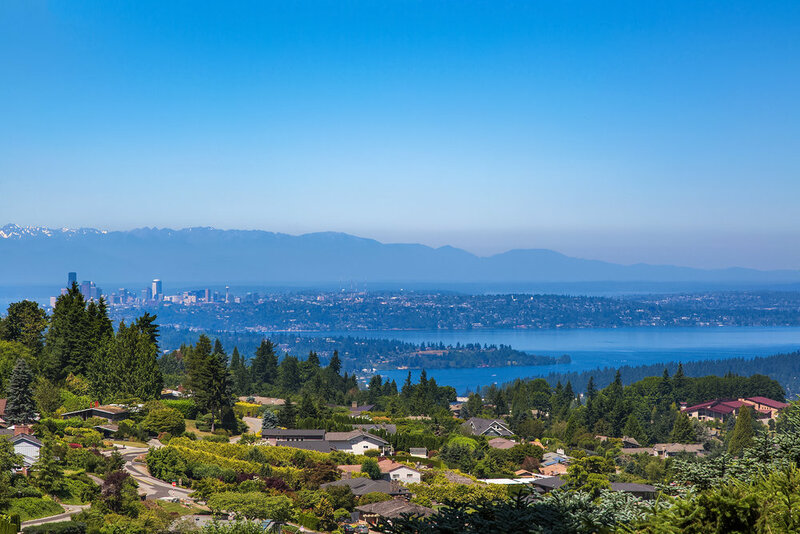 On the edge of the sought-after Summit community, Chateau Colline (Hilltop Castle) is poised to take in breathtaking views of Seattle, Lake Washington, the Olympic Mountains and beyond from virtually all of its primary spaces. This extraordinary European-inflected storybook Tudor house was originally constructed by a Boeing engineer to reflect his continental heritage and house his growing family in comfort and absolute tranquility, while affording a modicum of luxury and grandeur in its every detail. Originally constructed in 1981, Chateau Colline stands as one of the pioneering houses in the neighborhood, and occupies an unusually large 27,000 square foot lot with singularly advantageous siting that allows for sweeping views and tremendous privacy. The house is gently set into its mature landscaping to offer a series of formal and more casual gardens that graciously flow from one to the other, creating shaded outdoor living and regarding spaces that function as al fresco rooms. Architecturally, Chateau Colline is an elegant reflection of its creator’s European heritage, incorporating classic materials such as brick and leaded glass windows into historic forms that reference Northern European castles and Tudor homes of the previous century, including a large turret that defines its exterior and provides a sense of whimsy and history. Meandering paths lead around the home and through some of the most mature landscaping in the area, with gorgeous evergreen trees providing shade and a stunning cutting garden of roses. A landscaped path leads from the driveway to the secluded side entry behind the turret. The foyer offers a nicely defined sitting area to the left that overlooks the entry garden through leaded glass windows and flows to a hallway on either side, and forward into the primary public living spaces and to the main stair. 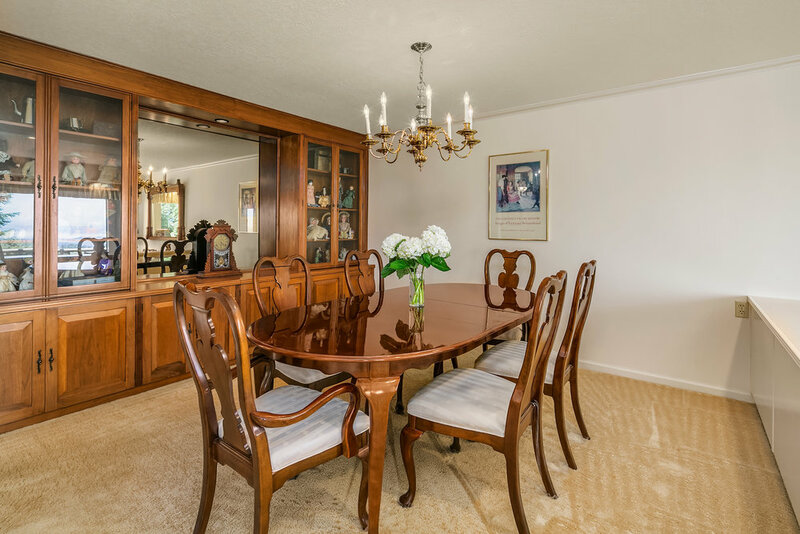 A spacious dining area lies just to the left of the entry and overlooks the living room and a more casual reading area with spectacular outlooks over the surrounding area and Lake Washington. The sunken living room provides a gracious space for formal gatherings and daily enjoyment, centered by a large marble fireplace and oriented to capture commanding views. 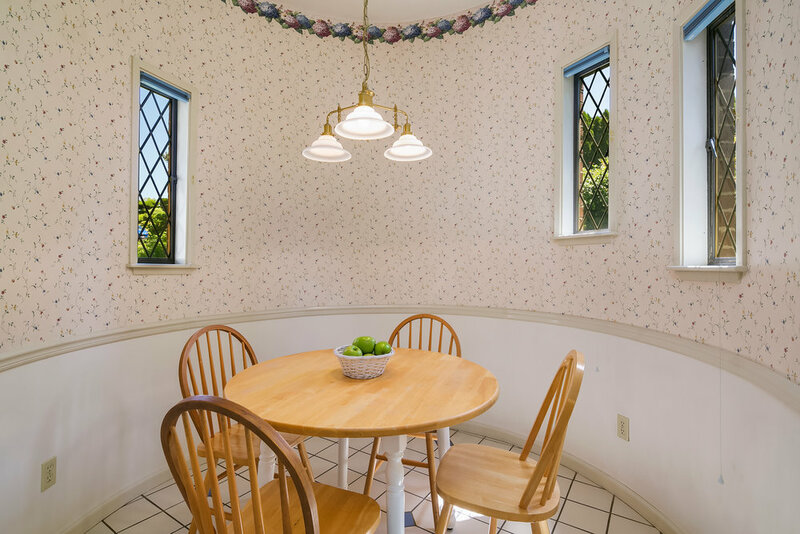 To its left is a more intimate sitting area that is separated from the dining room by a low wall. A meticulously crafted wall of built in walnut cabinets anchors the dining room, providing great amounts of storage for collections. Down the hallway to the left resides a spacious powder room and a gorgeous first floor master suite that overlooks the deck and views, and includes a huge bath with his and hers closets. Windows on two walls flood the room with natural light and frame outlooks over two private decks under a trellis for gentle shade. A pair of French doors opens to a screened private deck with easy access to the rose garden and lower level yard space. The master bath offers two walls of vanity cabinets and counter space, as well as a secondary bathing room with its own bidet. Leaded glass casement windows overlook the front yard and gardens. The hallway to the right of the entry leads directly into a spacious kitchen that gazes upon the entry path and which is anchored by a large dining and cooking island. Appliances include a wall oven, SubZero refrigeration and gas cooking. The turret provides a fabulous round breakfast and casual dining area with perfectly curved walls and a wonderful sense of volume. The kitchen opens into a delightful family room with French doors out to the deck and a fireplace set into a brick mantel with custom built-ins for storage. Just off of this room, a short hallway leads to an additional powder room and a home office with tons of storage that overlooks the back yard. The garage is easily accessed from this area, as is the basement. An open staircase off of the foyer leads up to the second floor, which includes two wings that radiate from a central hip at the top of the stair. To the right, three additional bedrooms are arranged along the back of the house so that they can take advantage of the home’s view orientation. They share a large full bath, as well as a wall of linen storage. Each bedroom offers tremendous amounts of closet and under-eave storage, and a pull-down staircase leads to a huge and fully insulated attic that could easily be converted into additional living space. The landing provides a light-filled reading nook that also leads into a suite of rooms to the left. This is a wonderful, private bonus area that can be used as a home office, craft area, play room, media room or guest quarters, and it includes ample insulated storage, as well as access to the back staircase that leads to the kitchen and garage. All of the second floor rooms offer details that include dormered window nooks, six panel doors and intricate formal moldings that accentuate the home’s sense of vintage charm and history. 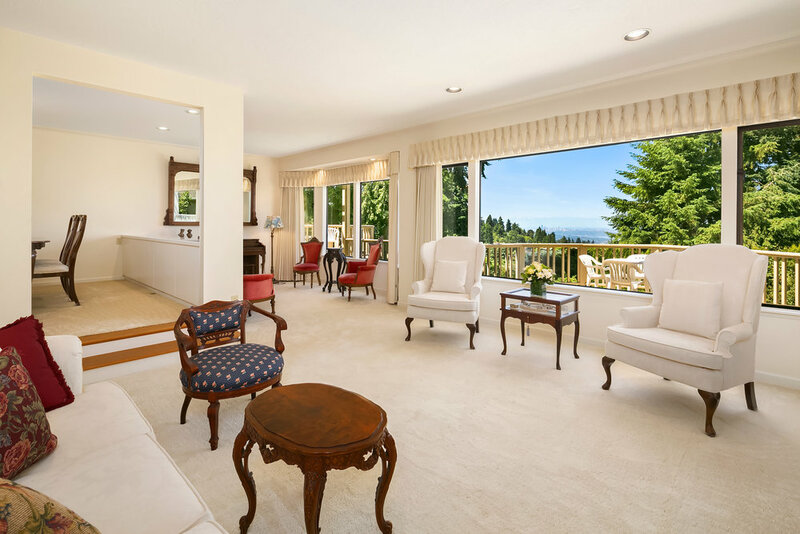 Windows on the view side afford some of the property’s most profound outlooks, capturing virtually all of Lake Washington and metropolitan Seattle, the Olympic Mountains and Mt. Baker beyond. Finally, the house features a rare and huge full basement with tall ceilings that can easily be converted into additional living space or used as highly organized dry storage. The lower level also includes a large wine cellar that maintains an ideal year-round temperature for storing vintages. Chateau Colline occupies one of the most extraordinarily sited pieces of property in The Summit area, with a mountaintop perch that allows for virtually unobstructed outlooks over the entire region. This is far beyond a more typical water or Olympic Mountain view in that it encompasses a vantage point that is truly majestic in scope and range. Multiple Independence Day fireworks displays can be viewed from above, at the same time. Seafair air shows can be seen in their entirety, while Lake Washington functions as a microcosm of nautical events in the background. Seattle is viewed as a whole, shining city in the distance. With over 27,000 square feet of space, the property allows for an extremely private and tranquil existence in a neighborhood that is typically more closely spaced. Mature native and specimen plantings define elegant European gardens and enclose outdoor spaces that invite a pause in the day for thoughtful reflection. Around the back of the house, the yard opens up to become a perfect place for larger scale outdoor entertaining, with a wide deck that covers the entire width of the house. This is a residence that revels in a refined indoor/outdoor relationship with its natural surroundings throughout all of the seasons of the year. The Summit community has grown to become one of the most desirable residential enclaves in the Puget Sound region. Offering one-of-a-kind views and its own micro-climate of refreshing breezes and sun-drenched afternoons above the cloud line, it’s no wonder that discerning locals have sought to call this area – and particularly Summit – home for decades. Despite its awe-inspiring setting, The Summit is only a 5-10 minute drive from I-90, with easy access to downtown Seattle, Bellevue and the Eastside tech corridor. It is served by exceptional Issaquah public schools, with Chateau Colline feeding directly into Somerset Elementary School, Tyee Middle School, and Newport High School. The neighborhood offers outdoor recreational opportunities that include the Cougar, Squak and Tiger Mountain Parklands, national-caliber golf at Newcastle, as well as quick access to skiing in the Cascades. Chateau Colline has served as a respite and inspiration for its art historian owner for the past 22 years. Combining historically inspired architecture with a stunning private setting, it is a residence that brims with uniqueness and charm and which frames exquisite outlooks from virtually every room. Whether maintained in its current form or used as the starting point for a personal architectural statement, this property represents a singular opportunity in this stunning neighborhood.